First, combine the first eight ingredients in a plastic bag or a marinade dish. Mix well. Add the flank steak and shake the marinade over the meat. Allow to marinate 12-24 hours, turning occasionally. 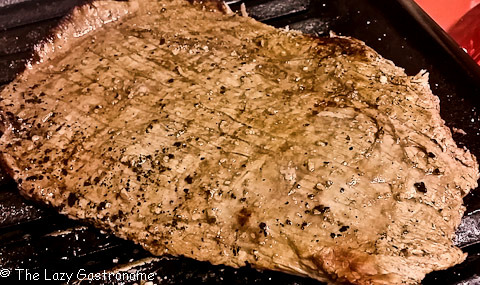 When you are ready to eat, remove the steak from the marinade and discard the liquid. Broil the steak to the desired doneness. We like it rare to medium rare so I cooked it about 3 minutes on each side. You can also put it on the grill for a great smokey flavor. 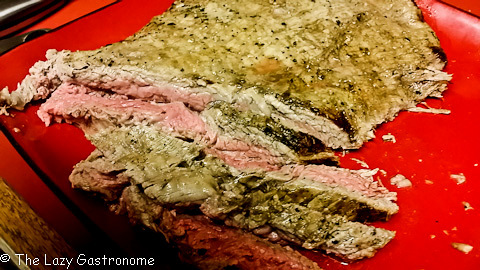 Allow it to “rest” for about 5 minutes, giving all those succulent juices time to move back into the meat. Slice it across the grain and serve hot. A great side dish is roasted baby potatoes and coleslaw (Got mine from the deli). **Finishing salt is a salt that is usually made of sea salt with a flavoring added. Sea salt does not dissolve well and is a stronger flavor so it doesn’t cook well, but finishes great. I used black truffle sea salt that I purchased from the Spice Merchant in Temecula, California, but you can also order it online. all content is copyrighted by H. Fern for the Lazy Gastronome. May not be reproduced without permission. A great week day meal – make the marinade the night before, then just prepare side dishes and broil or grill the steak! Combine the first eight ingredients in a plastic bag or a marinade dish. Mix well. Add the flank steak and shake the marinade over the meat. Allow to marinate 12-24 hours, turning occasionally. 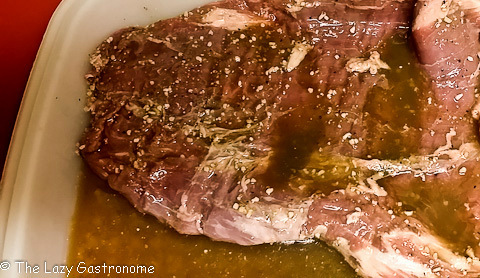 Remove the steak from the marinade and discard the liquid. Broil the steak to the desired doneness. We like it rare to medium rare so I cooked it about 3 minutes on each side. 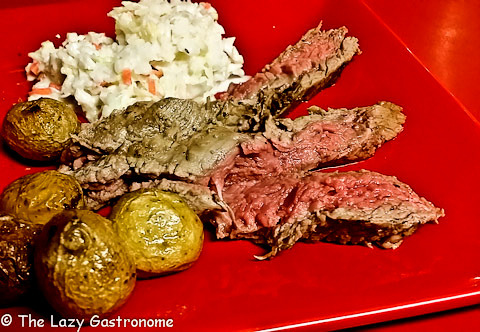 This entry was posted in Beef, Main dish and tagged beef, flank steak, main dish, marinade. Bookmark the permalink. I did a double take when I saw the sea salt. It can’t be from THAT Old Town Spice Merchant can it? ha ha! I live in the Temecula area. That store is dangerous, so many things to I’d want to buy. This recipe looks amazing! I have made a cowboy stew with coffee in it, but never tried it in a marinade. I will soon. The steak looks so good, I have been craving a tasty steak for about 2 weeks now. 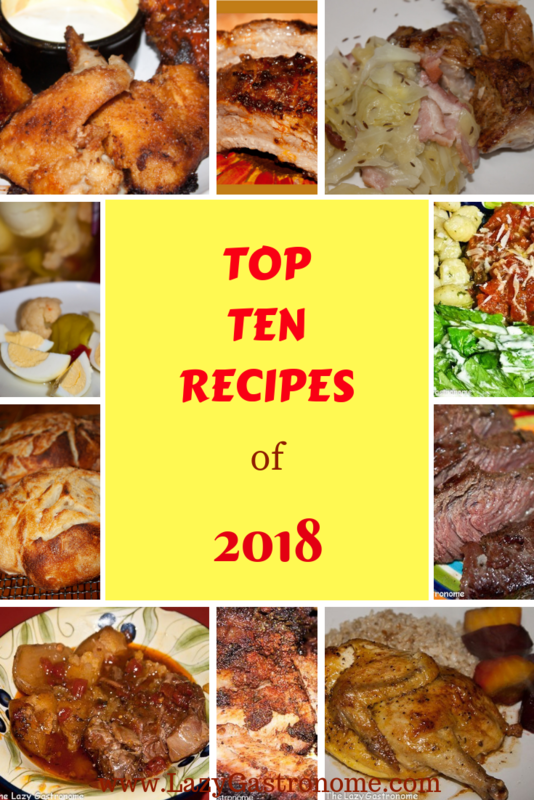 Thanks for visiting to share your recipe!! My pleasure as always Karren!! Glad you stopped by!